Born and raised in California, Andi Van Willigan has always had a passion for cooking.She grew up helping her father in the kitchen, as dinner was always a sit-down meal for the family and a time to enjoy good food with family and friends. She began her formal culinary career at the Boston Culinary Group in Pasadena, CA.She ran her own catering company before joining Stonehill Tavern, Michael Mina’s acclaimed restaurant in Monarch Beach, CA. Van Willigan spent the next five years as the Corporate Executive Sous Chef for Michael Mina Group and traveled across the U.S. helping to open 11 multi-million-dollar restaurants for the group in eight states. Van Willigan was Gordon Ramsay’s former Executive Group Chef for the U.S. where for the past 8 ½ years; she opened and oversaw all Ramsay’s U.S. and Canadian properties, as well television shows. (Hell’s Kitchen, Kitchen Nightmares, Master Chef, Hotel Hell). Van Willigan has been Gordon Ramsay’s right hand Sous Chef for Hell’s Kitchen for seasons 7-16. 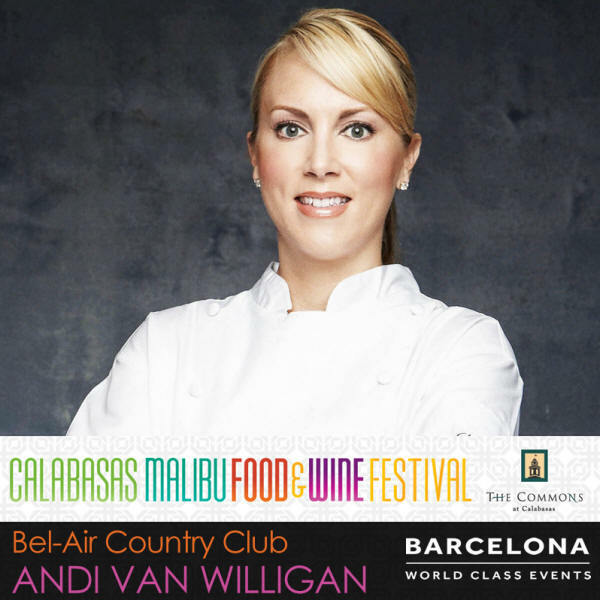 Van Willigan most recently is the Executive Chef and Culinary Director for Bel-Air Country Club where she oversees all food production for the 3 dinning outlets, the golf course and wedding venues. Van Willigan’s hobbies consist of deep sea fishing, hiking with her boxer and hosting wine dinners.